I had a cat who would purr so loud you could hear her over three rooms. 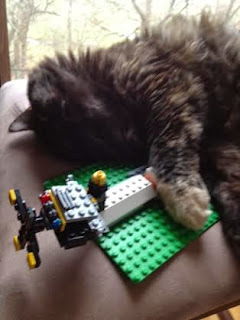 She was very fluffy, loved the grandkids, and even played with Legos. We named her George because of the cartoon. We had her for 2 or 3 years. She just never came home one day. We live in the country - foxes, raccoons, coyotes, probably bobcats, and a friend nearby has a photo of a big cat (panther, mountain lion, whatever) at the bottom of his hunting stand (insert irony). So anything could have got her. Our other cat has lived here for 13 years, no problem.